When the quilt top looked good, I started putting it together with the batting and back. It looked like after two attempts I had it smooth and taut. I have pinned it twice and now I started topstitching it, however it looks like my back is bigger than the top. HELP! I just bought a Brother 1500D and it will be here tomorrow. I have to finish this quilt for my granddaughter for Christmas and I am having anxiety over it. I am up at 1:30am instead of 5:30am worrying about having to take all the topstitching out and then the holes will be there. I put a lot of hours / days into this project. The pillow sham, sham, valence and tote to match turned out but this is a nightmare. The quilt top looked perfect until I put it together. I am going to ask you to read my response and then you need to step back from this project for a bit. You sound really stressed. (I so-o-o-o understand that feeling right now. My daughter has been diagnosed with depression and we are going through one of the tough periods.) 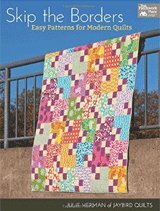 You need to get some relief from that before proceeding with the quilt. My best advice is go take a walk. I hope that doesn't sound condescending, it's not meant to. But it will get you out in the fresh air and breathing. You'll naturally have your body in a different position instead of tense and bent over your sewing machine. Your mind will have to pay attention to where you are as you take a step or cross a street instead of totally focused on your current problem. All of that is good for you. It will help you to relax. Put the rest of the problem in perspective. You've FINSHED the valance, pillow sham and tote. Those projects are done!...and can be wrapped for Christmas. If the quilt isn't finished, you are STILL a great grandmother. ...and you WILL finish the quilt. It will cover your granddaughter's bed. I have no doubt of that! Now let's get to the problem at hand! You said your quilt top looked good before you sandwiched it. If it didn't, that be a much bigger problem to fix. 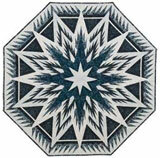 As for your batting and backing, they should be both cut 6-8 inches larger than the quilt top. As you quilt the presser foot actually pushes the quilt top out a bit further. At the same time, if you're adding a lot of stitches to the quilt top, the quilt will shrink up a bit, too. To be on the safe side, we quilters cut the batting and backing larger. I usually go for the larger 8" inch addition for added 'insurance'. So if the quilt top measured 60"x80", I'd cut the batting and backing 68"x88" or thereabouts. Here's a quilt that I'm in the middle quilting...as you can see, both the backing and batting extend past the edges of the quilt top. Since I've got the outside flying geese borders quilted already, I've trimmed off some of the excess batting so there's only an inch or two now. That's just how I work...but remember...I didn't do that until the borders were completely quilted. This next image is a quilt that my Mom was working on before she died. Notice, that she didn't have the extra backing and batting as I've suggested. However, she did edgestitch around the entire perimeter to hold the edges together. 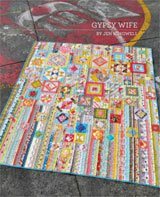 Most quilters I know, don't do it this way, but I show you the quilt as a reminder that YOU get to decide how you'll quilt your quilt; that the suggestions I provide are what work for me. You may be different and that truly is OK. 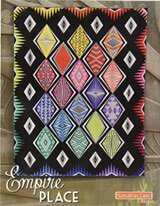 Whichever example you choose to follow, you still want the same result...that there are three complete layers of quilt once the stitching is finished. You've indicated that the backing is larger than the quilt top. Is the batting larger, too, or is it the same size as the quilt top? 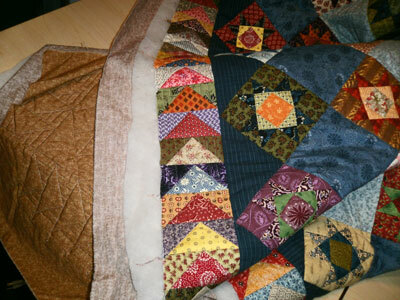 The excess backing will be trimmed off after all the quilting is finished. If the batting is larger, it, too, will be trimmed off after the quilt is completed quilted. This trimming off of both the backing and batting is called 'squaring up' the quilt. It is part of the normal process. If your batting is the same size as the quilt top and you are good with your current quilting stitches, then I recommend that you stop and add a line of stitching around the outside edge of the quilt sandwich, through the top, batting and backing to hold all the layers together and prevent the batting from shrinking on you. This stitching should be a scant 1/4 from the edge of the top, just like in the photo above. That way these stitches will be hidden when you add the binding. I hope this has helped a bit to reduce your stress. Your granddaughter is lucky to have you! I am seeing my granddaughters quilt. I am doing free motion quilting and have just seen that my backing is pleating up in some parts. How can I correct this? 3) You may be pushing your pulling too hard to move the quilt sandwich through the sewing machine. 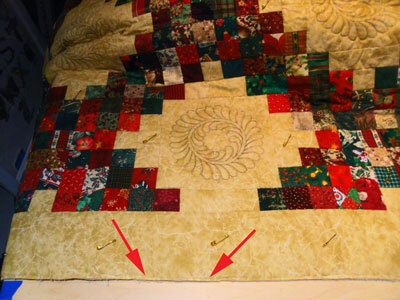 Remember, you can always go back and add pins to a quilt sandwich if they are needed. 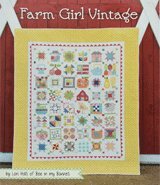 Make sure the quilt is flat and that layers are taut when you do this. As for the quilt, I made the mistake of the batting matching the size of the quilt. I somehow managed to sew it together then stitch the binding all the way around after stitching all the way around the quilt layers prior to the binding then started top stitching. So you say I must have done it backward. That's one problem. I am such a beginner. I didn't read anything before sewing - I always sewed clothes for my boys when they were little - some household things then always go through periods of no sewing, sometimes one or two years at a time after frustration with the machine or mistakes set in. I really took extra care to get the squares in a pattern then stitch straight lines and back stitch everything as well. I guess I am sad because either I cut the binding off, pull the stitches if possible out of the quilt and finish it after I buy more of the 5 prints of fabric - I am learning the hard way for sure. A good looking quilt top, with the promise of quilting, will be so-o-o-o-o appreciated on Christmas morning. As my daughter-in-law has said, it's all about tearing the paper off on Christmas morning when you are young. Your granddaughter will be so pleased that you thought of her for many hours while you sewed that beautiful top.